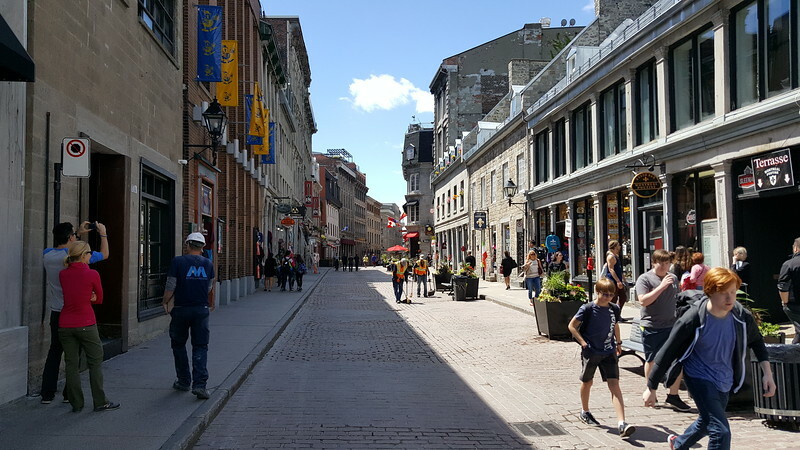 Ennis Davis, AICP of Modern Cities provides a review of Next City's 2017 Vanguard Conference in Montréal and suggests what it could mean for cities of the future. Established in 2003, Next City is a Philadelphia-based nonprofit organization with a mission to inspire social, economic and environmental change in cities through journalism and events around the world. Each year, Next City selects 40 people under 40 to their Vanguard Class and past members who have demonstrated their ability to have an impact on their city or the national dialogue about urban issues, bringing them together to collectively learn and think about how to improve our cities. According to Next City, Vanguard is an annual gathering of the best and brightest young urban leaders working to improve cities across sectors, including urban planning, community development, entrepreneurship, government, transportation, sustainability, design, art and media. 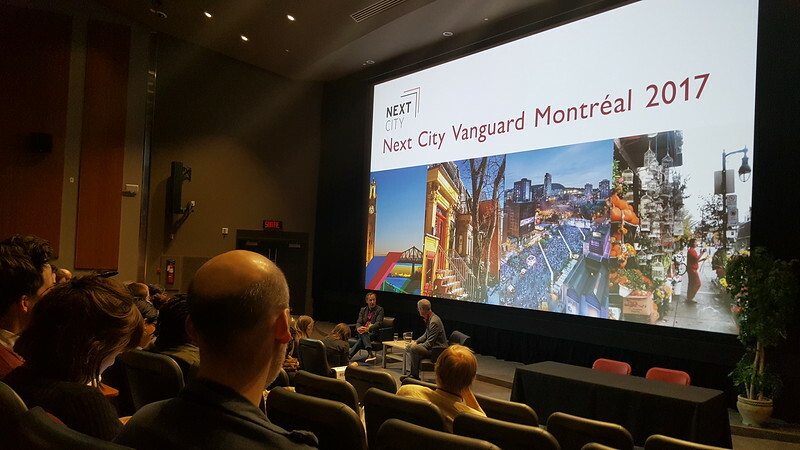 With that in mind and being a member of Next City’s 2013 Vanguard Class myself, I took advantage of the opportunity to attend the alumni track of Next City’s recent 2017 Vanguard Conference in Montréal. My reasons for attending were threefold. I view the annual Vanguard Conferences as an opportunity to reconnect with a network of friends involved in revitalizing cities from the bottom up globally, Montréal is one of the few walkable North American cities I had not previously visited and it shares an economic development history that is similar to Jacksonville, meaning applicable examples to successful urban revitalization strategies, for my community were sure to be found. While the scale and density of Montréal (2016 city population: 1,704,694, metro: 4,098,927) and Jacksonville (2016 city population: 880,619, metro: 1,478,212) can easily be described as night and day, I found it intriguing that both cities were incorporated in 1832, have historical port-based economies, seek to find new uses for old industrialized riverfronts and have experiemented with municipal consolidation. In addition, Jacksonville is a city where waterfront activation, revitalization of the old downtown core (Northbank), using night lighting as a revitalization tool, and demolishing an aging elevated expressway are all current hot topics. On the other hand, Montréal has successfully addressed these issues and is currently in the process of converting its elevated Bonaventure Expressway into a ground level boulevard and linear park. While it’s probably my fault for booking a 5:45am flight, showing up late to Jacksonville International Airport resulted in a missed flight and a missed opportunity to experience the start of Vanguard’s alumni track, which included a PechaKucha-style orientation to the city at the Canadian Centre for Architecture and presentation about Little Italy at Jean-Talon Market, a farmer’s market that dates back to 1933. 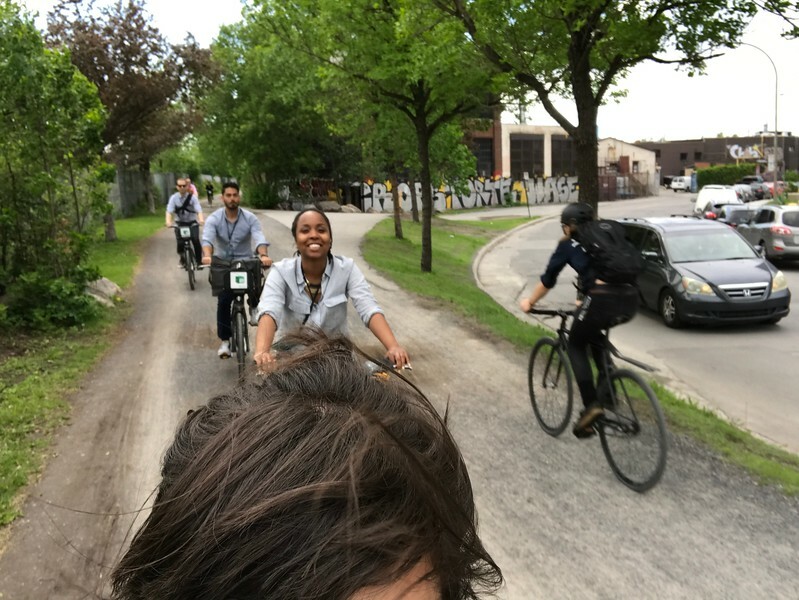 It also meant missing a bike ride and tour of Technopole Angus, a fast-growing commercial and residential development built on the former site of a railcar manufacturing, repairing and selling facility operated by the Canadian Pacific Railway between 1904 and 1992. Now home to 58 businesses, stores and services employing 2,500, it appears Technopole Angus could possibly serve as an example of how redevelopment can change the fortune of Jacksonville’s Lackwanna. Like the vibrant neighborhood surrounding Technopole Angus, Lackawanna is a former eary 20th century streetcar suburb built around the late 19th century Seaboard Air Line Shops & Terminals. However, unlike Technopole Angus, much of the Jacksonville site and adjacent West Jax yard has remained a brownfield wasteland and environmental albatross to the surrounding community since its mid-1980s closure. Nevertheless, my missed flight led to shared UBER ride and immediate opportunity to catch up with Sara Mokuria, a member of the 2015 Vanguard Class from Dallas, who arrived in Montréal at the same time. From there, we caught up with the rest of the alumni for dinner at a brasserie serving French cuisine called HOLDER in Old Montréal. Within an hour of arriving, I had already witnessed three applicable lessons for redevelopment initiatives under consideration in Jacksonville, in the form of historic preservation, lighting as a revitalization tool and the benefits of embracing a shared economy. Old Montréal, itself is a special treat. 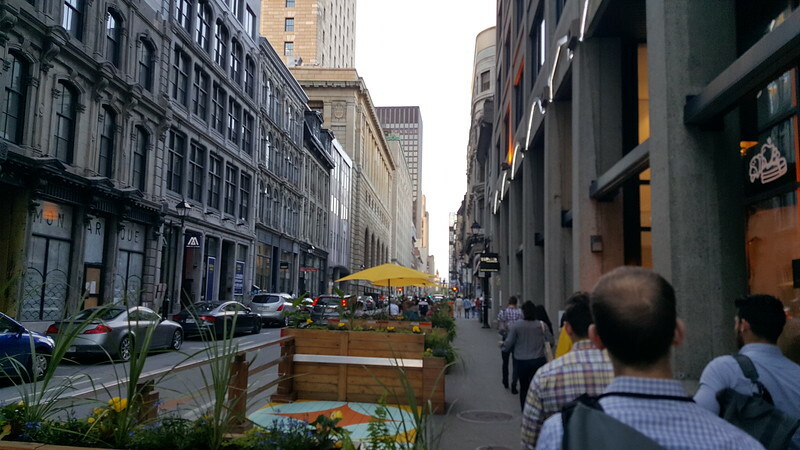 Dating back to the 17th century, it is one of the oldest urban areas in North America. At 0.27 square miles, what’s left is preserved for future generations to enjoy. 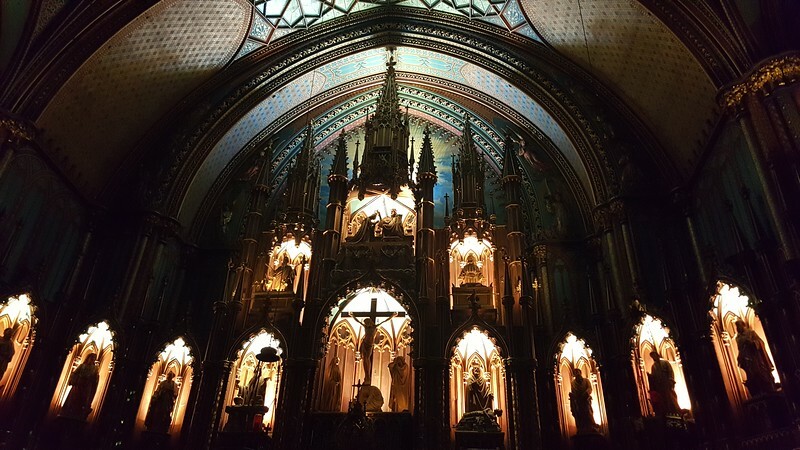 After witnessing a sound and light show detailing the history and architecture of Notre-Dame Basilica, a catherdal completed in 1829, alumni had the chance to learn about the district’s recent revitalization through the use of lighting. During a tour of the district with Moment Factory, a Montréal-based multimedia entertainment studio specializing in the use of video, lighting, architecture, animation, sound and special effects to create remarkable visitor experiences, the process of how a lighting plan was developed to highlight the unique buildings and different facade styles was explained. With the use of lighting as a major redevelopment tool, a district that was largely underutilized in the early 2000s, has become the leading tourist destination in the city. Like Old Montréal, there’s not much left of Jacksonville’s historic Northbank, which is unique in its own right for a Sunbelt city. Furthermore, lighting was installed on several St. Johns River bridges years ago but on-going maintenance costs have become a challenge. 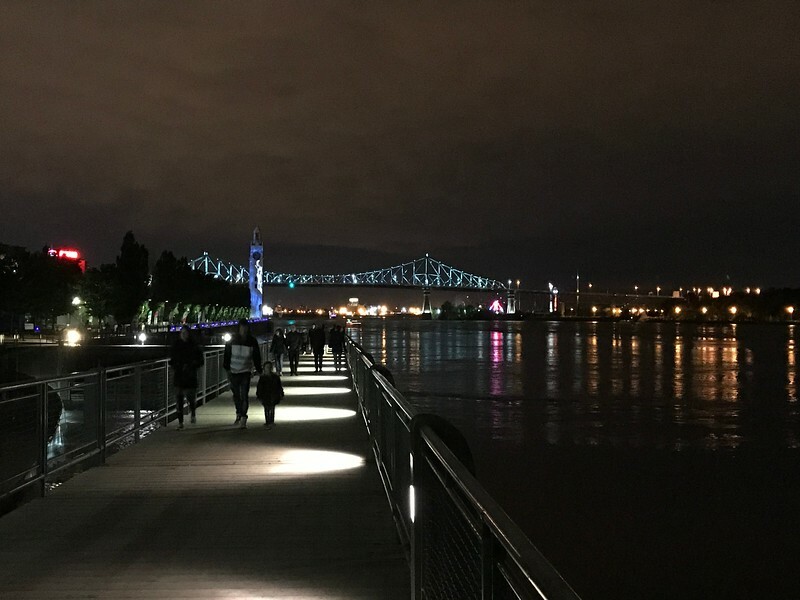 Montréal’s recent experience may provide lessons Jax by comparing resulting tax revenue generation with on-going maintenance cost to gain a better understanding of return of investment. 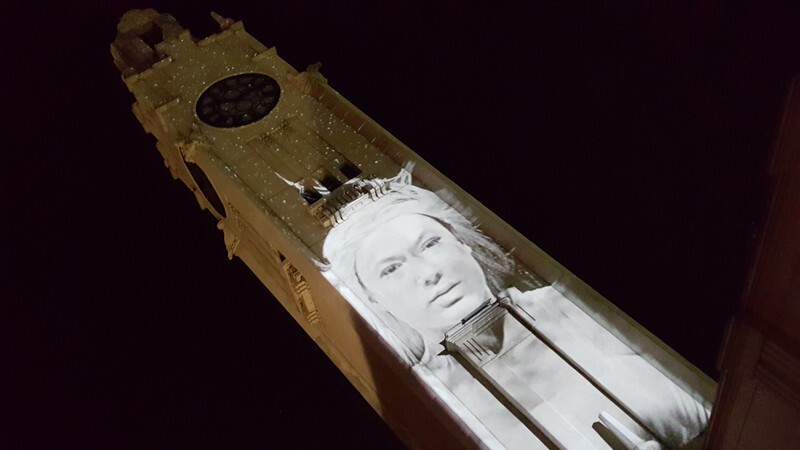 In addition to witnessing how the interative use of light and preservation can lead to local landmarks becoming entertainment destinations establishing a “sense of place” unparalleled in North America, my stay at the Grey Nuns was a lesson of potential economic opportunity itself. Located in the heart of downtown, the Grey Nuns is a co-ed residence hall housing Concordia University students that transitions into something that can be described as being “better than a hostel and cheaper than a hotel” during the summer. My immediate thought focused on this concept being a potential new source of revenue generation for Jacksonville colleges and universities with on-campus housing facilities.